I'm sorry to hear that your draws are unsuccessful. As far as I am aware, draws are totally random, and any coincidence is simply due to chance. However, if you notice a pattern, take some screenshots and submit them here to the forum. I would be very interested to see what you're seeing! There are likely two factors going on here. When you start playing a lot more games than you're used to, it will often seem like you're getting bad draws more times than you're used to because YOU ARE getting bad draws more times than you're used to, but only in a "raw numbers" sort of way, not by proportion. You are also getting great draws more often than you're used to, but generally people don't notice as much when they draw decent or good letters as they do when they draw terrible letters. For example, if a person played a single game, he might get 2 good draws, 10 average draws, and 2 bad draws. He probably wouldn't say his draws were particularly unlucky or un-random. Keeping this proportion, if he plays 10 games at a time, he might get 20 good draws, 100 average draws, and 20 bad draws. However, the 20 bad draws are likely going to stick out in the player's mind significantly more than his average and good draws, since normally people dwell on bad letters a lot more than good letters, since bad letters are usually accompanied by staring at the board for 15 minutes in anguish, while decent-good letters involve none of this discomfort. Having this happen to you 20 times instead of just 2 times is likely going to mentally create a situation where the player thinks the draws aren't random, but that doesn't mean that the game isn't fair. Sometimes drawing bad combinations of letters is simply bad luck, but more often than not, it's actually the result of not practicing proper rack management. 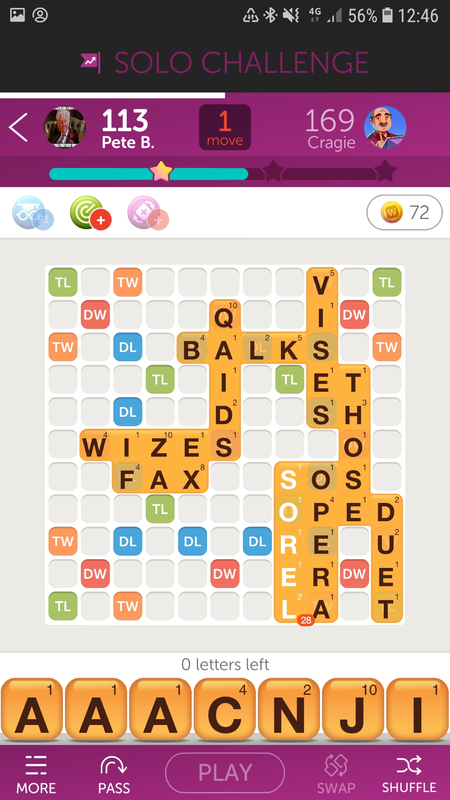 You mentioned that in several games that you have no vowels or consonants, which is a big clue that you're not putting much consideration into rack management when you play. Rack management involves paying attention not just to the letters you're putting down, but also to the letters you leave behind on your rack. It may be surprising, but the letters that you leave behind are usually just as important as the ones you're laying down. Ideally, you want to have a rack that has a 4:3 consonant to vowel ratio, since this generally maximizes the number of words you can play. Obviously, you won't always be able to make this happen, but the way to increase the chances of this happening is to keep your rack balanced. As for duplicates, you should always be trying to play off duplicate tiles as you draw them to avoid the possibility of drawing even more of the same tile (the only exceptions are E's, S's, and blank tiles, and the first two you shouldn't keep more than two of at a time). Obviously, it can't be helped if you draw all of the duplicates at the same time, but that doesn't mean it's all out of your hands. You can also pay attention to how many of a certain letter have been played and let that be a factor in your playmaking. For example, If my rack is BOSTANI, and I'm choosing whether to play BAIT or BOAT, I could look at the board and notice that only two O's have been played and there are only 20 letters left. In this situation, it would be wise to play off the O with BOAT, since there are 8 O's in the game and it's likely I will draw one or more O's after I play BOAT. Thinking this way and employing this kind of strategy can help you prevent drawing duplicates. You don't have to memorize the entire tile distribution. You will likely cure most of your duplication woes if you memorize the frequency of each vowel, as well as the number of R's and T's (the most common consonants). I had a bunch of vowels and only one consonant so I swapped 4 of them. Got the same tiles back. Next turn I swapped all 7 and got 6 of the 7 back. Next turn swapped again and got all 7 back. I quit playing for about a month I was so infuriated. That's "random"? I play against 5 people daily. I've noticed most of my lousy draws come against the same opponent. I may do like Walz and quit playing. Been discussing the same situation with 2 gaming friends, as well. Think the tiles you swap should be excluded from the pile for your turn... just as they would be if playing in person, sitting at a table. Seriously, what **** would put down all 7 of their tiles, then pick back up the 6, or even 7, of what they just laid down thinking they would be magically different??? A: no one!!!!! I wish I had seen this thread before I posted a similar complaint in the 'suggestion and feedback' forum. It has a screenshot. I just read the post with the suggestions for avoiding the duplicates but I've already tried them all. They don't work for me. I get rid of the duplicates, only to receive more duplicates. Classic example: Was ecstatic when I finally got rid of all five I's. After the play, I was left with two consonants (no duplicates). The game responded by giving me four A's and one T. I mean, really. This is how it is for me. I've already concluded that I'm basically unlucky as far as this game is concerned. Now I'm stuck trying to get rid of the excess Ts in as few plays as possible. As usual, my opponent is winning. I just read the post with the suggestions for avoiding the duplicates but I've already tried them all. They don't work for me. I get rid of the duplicates, only to receive more duplicates. Classic example: Was ecstatic when I finally got rid of all five I's. After the play, I was left with two consonants (no duplicates). The game responded by giving me four A's and one T. I mean, really. This is how it is for me. I've already concluded that I'm basically unlucky as far as this game is concerned. Actually, near the end of the game (I'm guessing the game is nearly over, from the screenshot), the drawing does seem a little less random, but not for the reason you seem to be suggesting. There is a finite number of each letter in the bag. This is something that seasoned players consider when they make plays at the end of the game. They try to notice if an unusual number of the most common letters have been played (AEIORTN) so that they don't suddenly end up with a bunch of the same letter at once like you did. For example, if the game is very nearly over and only 5 A's have been played, you are at a very high risk of drawing several A's at once if you play several tiles at once, since there are 9 A's in each game. In this situation, it would be wise to actually play a small word (preferably using up an A if you have one) so you automatically limit the number you draw (and hopefully force the duplicates on your opponent!) Keeping a rough count of the AEIORTN letters throughout the game will help with your duplication woes. As it is, I would love to have the "problem" that you're having -- drawing a ton of the one point tiles. Having a bunch of the one point tiles in any game is actually extremely lucky, since it increases your chances of being able to make a bingo -- a play that uses all 7 of your tiles at once and nets you an additional 35 points. 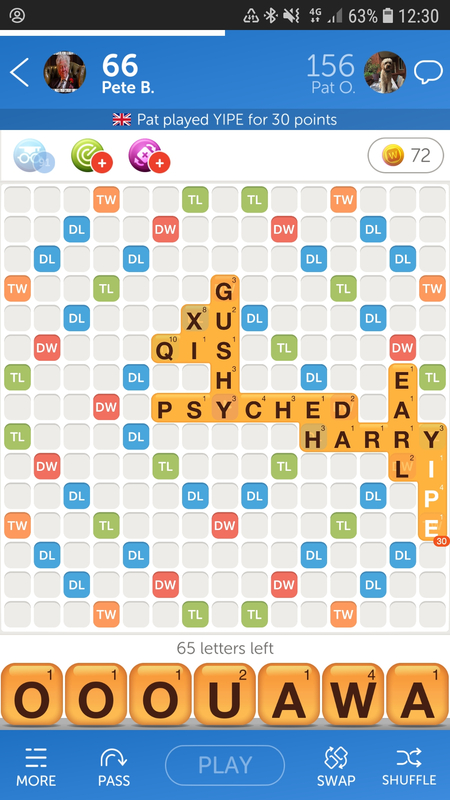 Naturally, it's more difficult to make 7 letter words with Q and J for example. Since the one point tiles are much more common letters and form hundreds of times more words than the high value tiles, it is much easier to make bingos with the 1 pointers, a tremendous advantage. Between two equally experienced players, the game is more likely to be won by the player who draws more of the 1 point tiles (and blanks). This is not random. This is a feature designed to make you buy the 'swap' powerup. Here are screen grabs from games I was playing today, all at the same time. 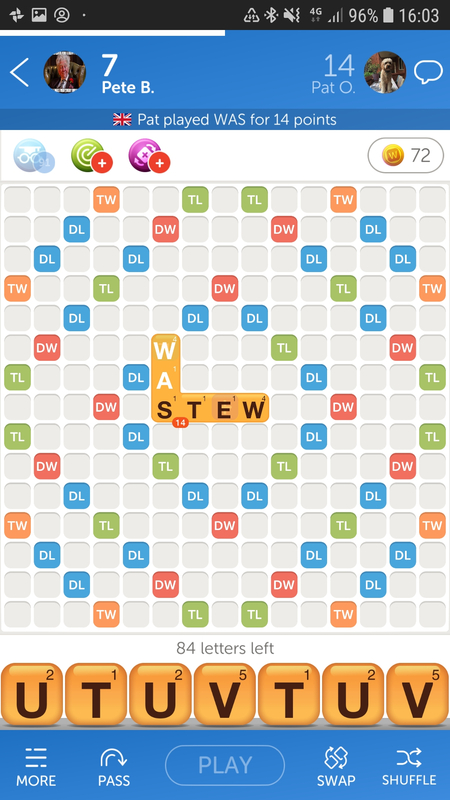 In real world Scrabble, it's very unusual to get draws like these. I bet the chance of getting these draws in three simultaneous games is astronomically small. PBurger. I believe the power up purchases are only available on wwf2. I cannot load 2 onto my Kindle as it is not available for that device - I constantly get UN-random tiles on wwf one. Honestly, the letter distribution is so ridiculous! i ather bunch vowels because alot 2 letter words can spelled.why dorsnt swap plus tool!